Why did I become a Naturopathic Beauty Doctor specializing in beauty? Quite simply, because I experienced devastating beauty issues that seriously rocked my self-confidence and changed my personality. Growing up I never even considered a career in medicine, instead I always thought I would end up in advertising or fashion (both of which I did try for a while, actually). But when my acne and hair loss started to seriously affect my life (and I could not safely and permanently solve my beauty issues) I knew what I had to do. I had to learn how to solve these devastating beauty problems for all women – because the suffering is real and safe, permanent solutions are rare. I grew up in rural Alberta, Canada with three younger sisters and a baby brother. I spent a lot of time playing outdoors, developing both a curiosity and respect for nature. Life was good. And when puberty set in, and so did my acne. I dealt with it as so many of us do – prescription topical creams, pressed powder make-up, and a lot of really bad skin products. In other words, I got by. But my skin was never clear. At seventeen, I moved to Montreal to study at McGill University. With the change in my lifestyle, my skin flared up in a big way. I had no idea that acne was a sign of an imbalance within my body, and I had never even heard of natural medicine. So, I did two things: I went on birth control pills and applied a few topical prescription creams. For the next ten years, what acne? School, life, acne, it was all somewhat under control. I finished my degree at McGill and started working in the fashion business – clearly no place for bad skin. I founded and produced an award-winning AIDS Benefit Fashion Show in Montreal, produced the Canadian Ready-to-Wear Fashion Shows in Toronto, worked at the coolest ad agency in Canada and then married a crazy musician all while studying yoga like my life depended on it (in hindsight, it probably did). At the height of our success, my husband and I decided to sell all of our belongings and back-pack around the world for a year. It was during this trip that everything began to fall apart. My life’s implosion was caused by two things: my marriage was a complete disaster, and inspired by all my yoga training I decided to go ‘au natural.’ And so, in a moment of clarity on Kho San Road in Bangkok, I threw out my birth control pills and my prescription topical acne medications. I would no longer allow my body to be governed by synthetic hormones and prescription medications. But I had no idea what I was doing and within a week my face was breaking out and my hair was falling out. Within a month, I looked like a complete disaster. I didn’t know it at the time, but I was experiencing the symptoms of post-pill PCOS. I tried to enjoy my trip but it was nearly impossible for me to meet new people, feel confident and relaxed. I remember actually preferring to curl up inside my $7 a night hovel in Calcutta rather than going out to meet fellow travellers at the local back-packer hang-out. My acne had completely changed who I was. Back in Toronto, things only intensified. My marriage was ending, I couldn’t sleep, I had no idea what I wanted to do, and all the doctors I saw wanted to put me on Accutane, which did not appeal to me. I felt that there was no way I could go back to my career with my awful acne, and I felt ashamed and embarrassed whenever I would see my friends or colleagues. I was a stressed out, Type A perfectionist, caught in a paralyzing panic and trapped in a vicious cycle. It was during this time that I first saw a naturopathic doctor. Regrettably, few specialized in acne and hair loss. But their medicine inspired me. I thought, “Hey! This is how I can learn how to heal my acne and hair loss from the inside out – and perhaps help other women as well.” And so, I got accepted into the 4-year Naturopathic Medicine program at the Canadian College of Naturopathic Medicine. The truth is that I became a Naturopathic Doctor so I could reclaim my beauty from the inside out; without drugs or temporary fixes. When I first met L.B. she had been suffering with acne for as long as she could remember. She had seen many different dermatologists, naturopathic doctors and aestheticians but her skin was not improving. Upon further investigation I discovered that her diet included lots of sugary foods, her periods were erratic and painful, and she suffered from extreme anxiety. Over the next few months, we worked on improving her diet by cutting out sugars and structuring her meals so that her insulin was steady throughout the day. I gave her some herbs to support her liver, and encouraged her to practice meditation or listen to relaxation recordings at least once a day. Slowly her skin started to improve. She also experienced more regular periods and a reduction in her anxiety. L.B.’s skin is beautiful today, and as long as she maintains the diet and lifestyle changes we put in place together, she feels amazing. Upon graduating, I began working with some of the best dermatologists in Toronto. I spent the next fourteen years treating patients in a clinical practice and developing natural programs that target the root cause of acne, hair loss and aging skin to maximize my patients’ beauty. My face has been clear for many years now and my hair has re-grown, but I still get an incredible buzz whenever I witness the sheer joy my patients experience when I help them to reclaim their confidence and their lives by clearing their skin, re-growing their hair and minimizing the signs of aging. My hope is that my programs can help as many people as possible, helping them cultivate their true beauty once and for all. But wait, there’s more to my story. Even though I was able to solve my acne issue, occasional break-outs would still occur and I lost a TON of hair after my children were born. I was an insomniac and I had crushing anxiety. Here I was, following a near-perfect naturopathic existence when it came to exercise, diet and supplements, but I was missing a crucial piece of the puzzle – STRESS. In January 2015, I experienced the best thing that ever happened to me (other than my children, of course) – a very rare heart attack. It forced me to acknowledge the things in my life that were causing me undue, if not uncontrollable, stress. I had no choice but to find a way to deal with it – death really was the only other option. The soul-searching that I have been doing over the past few years, the education and research on stress and mind-body medicine, is the final piece of the puzzle as it relates to overall health and, of course, hair loss, aging and acne. I have integrated all this knowledge into my programs, because managing stress is a vital component in solving ALL health issues. And now, I can’t wait to help you change your life! The soul-searching that I have been doing over the past few years, the education and research on stress and mind-body medicine, is the final piece of the puzzle as it relates to overall health and, of course, acne. I have integrated all this knowledge into my Clear Skin Program, because managing stress is a vital component in solving ALL health issues. And now, I can’t wait to help you change your life! P.S. 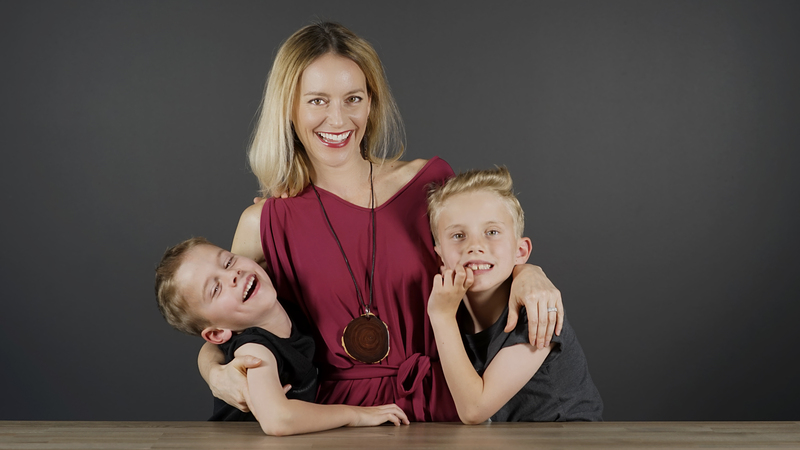 – I now live in Toronto with my husband, Tim, and my two sons, Kai and Luke. I get up early every morning to meditate, do yoga and, if possible, spend a bit of time in nature. S.N. is a high-powered executive who came to see me with acne that embarrassed her and prevented her from being as confident and successful as she desired. Her acne didn’t really become a problem until her mid-30s, when she went off the birth control pill with the hopes of starting a family. A few weeks after stopping the pill, her skin flared and it had not stopped flaring for a few years. She had been trying everything, and spending a ton of money. She came to me as a last resort. We reviewed her diet, ran a series of laboratory tests and talked about her lifestyle. S.N.’s diet was poor, consisting mainly of snack foods, restaurant meals and a lot of coffee. Her work hours were long, her stress was high and she felt as though she didn’t have a lot of time for herself. Her lab results revealed high DHEAs, which is an androgen that is secreted by the adrenal glands in times of stress and can contribute to acne. The first step was to help S.N. find some time to do activities that she enjoyed and reduce her stress. We then focussed on cleaning up her diet to balance her insulin levels and provide her with the nutrition that her body, and skin, requires. I also gave her some herbs to help detoxify her liver and reduce her DHEAs levels. Over a few months S.N.’s skin improved tremendously, as did her energy and overall sense of well-being.